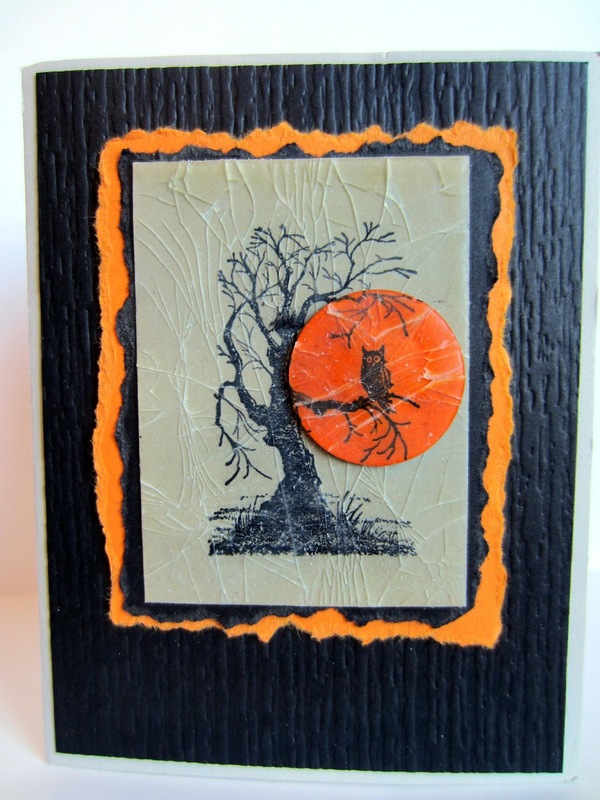 Here is a Halloween card that is chillingly fun to create! And I do mean chilling. So, grab your broom stick, I mean stamps and ink and freezer, and let's create some chilling fun! DO THIS FIRST! 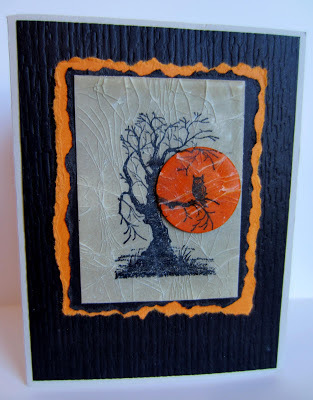 On a 2 3/8" x 3 1/4" piece of Sahara Sand card stock, stamp the tree in Black StazOn. Om a scrap of Pumpkin Pie card stock, repeat, although you only need the owl portion on his branch. Punch out the owl with the 1 1/4" Circle Punch. Make yourself comfortable near the Heat Tool. You'll be there awhile. With Dotto Adhesive, adhere the owl circle temporarily to the end of a long strip of scrap paper to protect your fingers. 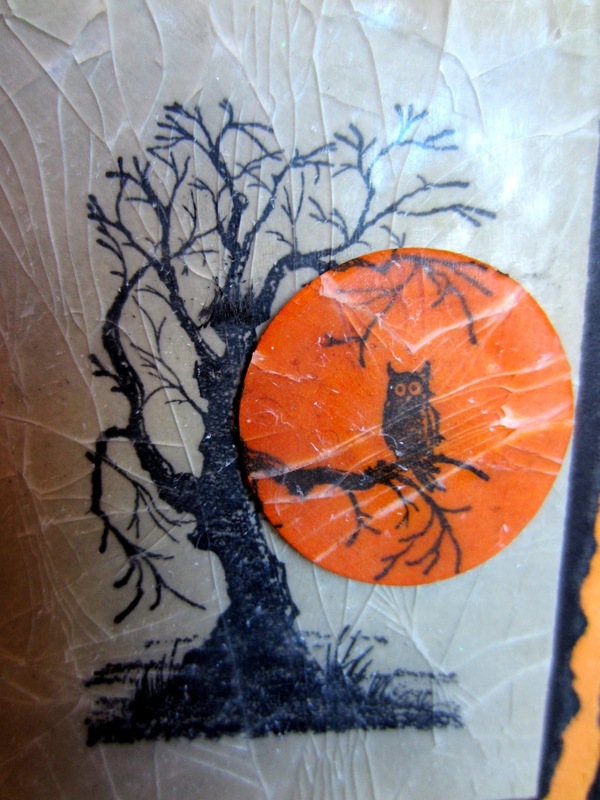 Place both the tree and the owl circle face up on scrap paper and cover both the stamped tree and the owl circle with VersaMark. Immediately dump Glassy Glaze Enamel over them both, tapping excess back into the jar. CAREFULLY use the Heat Tool on the images until the crystals melt. Repeat this same procedure three more times so you have a total of four coats of Glassy Glaze Enamel on both pieces. After four layers, your pieces should be fairly smooth and thick. Put both of the pieces into the freezer. Yes! In the freezer. It should remain in there for about ten minutes. Fold a 5 1/2" x 8 1/2" piece of Sahara Sand card stock in half, creasing well with a bone folder. 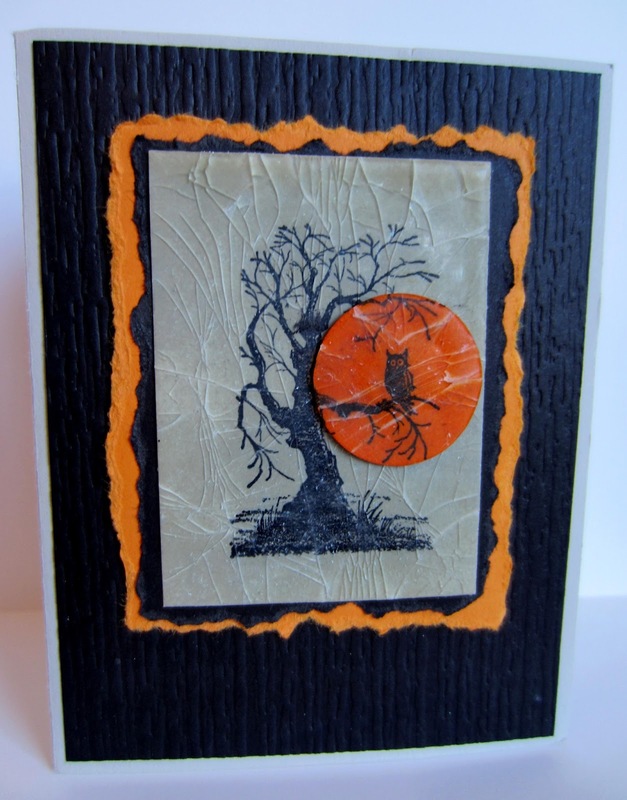 Run a 4" x 5 1/4" piece of Basic Black card stock through the Big Shot, using whichever spooky embossed folder you have chosen. Adhere the embossed black card stock to the card front. Tear all edges of a 3 1/4" x 4" piece of Pumpkin Pie card stock, as well as those of a 3" x 3 3/4" piece of Basic Black card stock. Ten minutes should be up, so take your two pieces from the freezer, and immediately start bending and cracking the shiny surface. If you stop getting cracks before you're satisfied with the spooky look, put them back in the freezer another 5-10 minutes. Keep repeating this until you have just the look you want. The end result is fairly shiny, and in my eyes, not all that scary. So I used a Sanding Block on them until I liked how it looked. Adhere the tree piece onto the torn black paper. Put the owly moon right where he belongs on the tree branch with a Stampin' Dimensional. 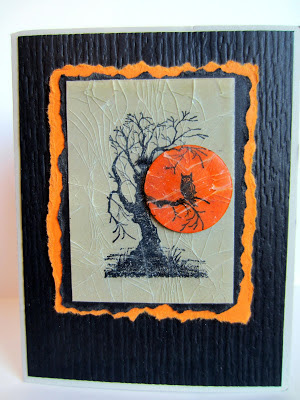 Adhere the torn black to the torn orange piece, then to the front of the card. And here it is once again in all its glory. Hoo hoo. I love your card. The cracked glass technique is so neat. I wouldn't mind getting a card like this. I really like this card! It looks like something you'd hang on the wall for fall/Halloween decor! I'd love for you to share this and any other crafts at my new linky party, Submarine Sunday. I hope you'll stop by!